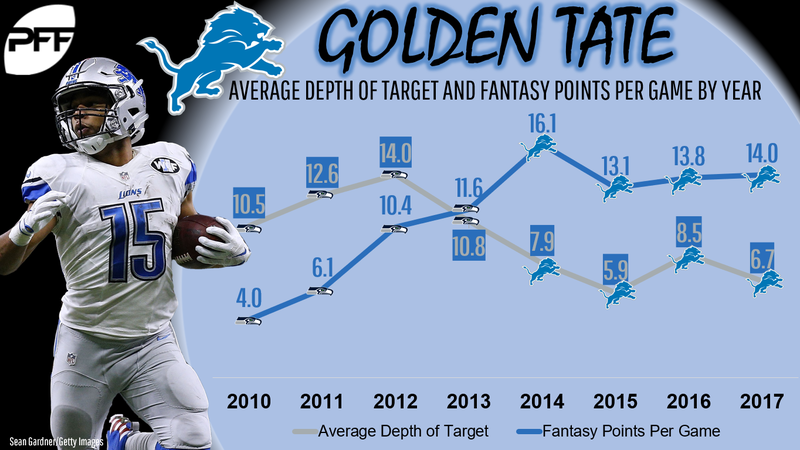 Metrics that Matter: Is Golden Tate among the league's elite WRs? In our last article, we highlighted Travis Kelce and how effective he is at creating yards on his own once the ball is in his hands. Over the past two seasons, he leads all tight ends in yards after the catch (by 479) and in missed tackles forced (by three). This data is available to all PFF Elite subscribers. The wide receivers on this chart are sorted by raw PFF grade and the complete list accounts for all wide receivers to play at least one offensive snap. This page allows you to sort by any of the listed statistics, but our focus today will be on yards after the catch and missed tackles forced on receptions. Last year’s league leader, in both categories, was Tate – also our No. 7-graded wide receiver. Last year, he led in yards after contact by 108 and in missed tackles forced on receptions by five. He ranks top-five in yards after contact in each of the past four seasons and top-three in missed tackles forced in each of the past six seasons. Since 2012, Tate ranks sixth in receptions but leads in missed tackles forced on receptions (132) by 48. For perspective, 48 missed tackles is the same difference between the No. 2 wide receiver in missed tackles forced over this stretch (Antonio Brown) and No. 24. His supremacy in these categories is all the more evident when looking at Tate’s numbers on a per-target basis. Among all 165 receivers to see at least 100 targets since 2012, Tate ranks first in missed tackles forced per reception and third (behind only Tyrell Williams and Josh Gordon) in yards after the catch per reception. Relative to his production and efficiency, Tate seems like one of the league’s most underrated weapons, and I feel this is the case for quite a few slot wide receivers. Recent PFF studies have found teams are actually more efficient (by expected points per attempt) when targeting wide receivers in the slot rather than targeting wide receivers outside, but rarely do even exceptional slot wide receivers draw similar praise to their outside counterparts. Fantasy players and fans seem to discount slot wide receivers by looking at simpler metrics like raw yards or touchdowns, but, really, we’re penalizing them for a role that isn’t especially conducive to high-yardage totals. The more yards in air a receiver draws, the more likely they are to rank highly in total receiving yards. Slot wide receivers, working underneath, typically amass fewer yards in air and fewer total yards than their outside counterparts. Among all receivers, Tate ranks just 33rd in receiving yards per game over the past five seasons. This seems underwhelming, but looks far better when realizing Tate also ranks 94th in yards in the air per game. Tate clearly stands out here, highlighting just how good he is at what he’s asked to do. For all of the reasons highlighted above, I think he should be viewed alongside the other elite wide receivers in the NFL. Where Tyreek Hill is an elite deep threat and Antonio Brown is elite at everything, Tate is an elite underneath option. Relative to his peers serving in a similar role, Tate truly does appear elite. Tate will continue to be what he’s always been for fantasy: A very safe and dependable fantasy option in the high-end WR2-range. Although he won’t rank highly in total yards due to his role, he will continue to rack up a high number of receptions (he ranks top-10 in receptions in each of the past four seasons) which are massively valuable for PPR leagues. Tate has finished 12th (2017), 17th, 23rd, and 11th among wide receivers in PPR over the past four seasons. In PPR fantasy points per game, he’s finished 15th, 19th, 27th, and 12th. Not only was he extremely productive, but he was also incredibly consistent, finishing tied with the third-most WR1 weeks and fifth-most WR2 weeks last season. His current PPR ADP places him at WR24, which means he’s an extremely strong value, priced below his most recent floor. As an interesting aside, I noticed something peculiar when digging deep into these numbers. Albert Wilson is the only receiver to average more missed tackles forced per reception than Tate since 2014 (when Wilson joined the league). He’ll be fighting with DeVante Parker and Kenny Stills for outside work this year in Miami and will also be competing with Danny Amendola for slot duties (where Wilson ran 68 percent of his routes over the past two seasons). Wilson earned a longer contract worth more money per year than Amendola, so he’s likely the favorite there, and, of course, these numbers and the value of the role while Jarvis Landry was there are definitely encouraging for his 2018 fantasy prospects.